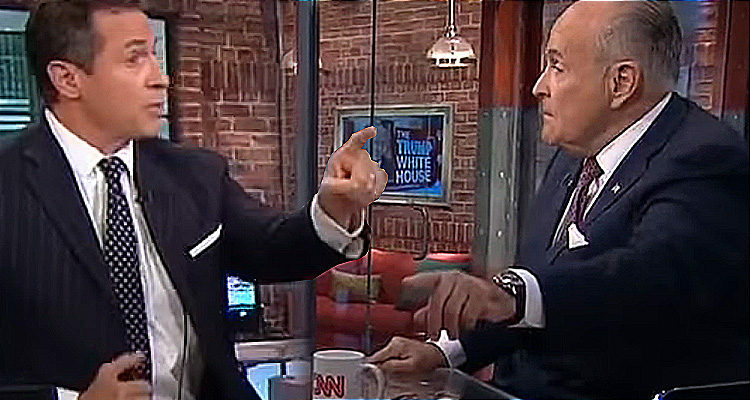 Trump’s top personal attorney, Rudy Giuliani, has a fit – crying “unfair” when CNN’s Chris Cuomo calls him out for saying that Clinton had to obey a subpoena but Trump doesn’t. Rudy Giuliani dropped four major bombs during an appearance on ABC News the first Sunday of the month (06 May 2018). Trump may have paid off other women in addition to Stormy Daniels. Asked about the possibility of Trump getting subpoenaed by Mueller to testify, Giuliani answered: “We don’t have to” comply with a subpoena. Fast-forwarding to this morning, Giuliani had a meltdown when CNN host Chris Cuomo questioned him about remarks he made during an interview with Charlie Rose during the 1990s in which he emphatically stated that then-president Bill Clinton had to obey a subpoena during the Whitewater investigation. Giuliani tried to qualify his statement claiming that he was speaking about a subpoena for documents and not about an “in person” subpoena. Cuomo wasn’t have any of it and, after having some words back and forth, he played the clip. However, as he played the clip, Giuliani can be seen pointing his finger and complaining that it was “unfair” for Cuomo to play that clip.